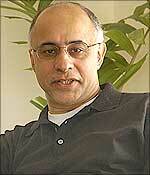 Subroto Bagchi, co-founder & COO, MindTree Consulting. "The Indian IT sector has proved that ordinary people can do extraordinary things. It has proved that the colour of your skin is not an impediment to global dreams." True to his own words, Subroto Bagchi, , co-founder and chief operating officer, MindTree Consulting [Get Quote], is indeed an extraordinary Indian. He started his career as a clerk in a government office in Orissa at a meagre monthly salary of Rs 305, three decades ago. Giving up the government job, he joined DCM as a management trainee in 1977, where he got a first hand impression of the corporate world. He then stepped into the IT world and rose to become Wipro [Get Quote] Global R&D's chief executive. After a successful stint at Wipro, he moved to Lucent Technologies. But in the heart of hearts he always believed that an entrepreneur could be a catalyst for social change. Bagchi -- along with Ashok Soota (now chairman and managing director of MindTree), the then vice chairman of Wipro, and eight other successful professionals who came from varied backgrounds -- founded MindTree Consulting in 1999. In a span of just seven years, MindTree has recorded phenomenal growth and is now reckoned as a powerful global IT brand. "We are India's first venture-funded IT services company to go from an idea to an IPO," Bagchi says. Today, MindTree is a 5,600-member strong team with presence in 18 countries, with a wide range of service offerings in both information technology solutions as well as product realisation services. Looking back, Bagchi recalls that many doubted their capabilities. "Some said we are a bunch of well-fed corporate rats and we may not work with sleeves rolled up. Others said we are 'top-heavy' because we were ten co-founders." But it did not take long to prove them all wrong. He says India needs thousands of more entrepreneurs to see their lives as a blessed act to build large, sustainable, memorable institutions for others, ahead of their personal greed. Author of The High Performance Entrepreneur: Golden Rules For Success In Today's World, Bagchi is truly a high performance entrepreneur who believes, "Today, ideas are not chasing resources. Resources are chasing ideas." Bagchi, an inspiration to millions of Indians, talks about the success story called MindTree and what makes him a great entrepreneur in an interview with Assistant Editor Manu A B. What is the innovation that won you the Nasscom award? MindTree innovated the way in which a structured, for-profit organisation creates a knowledge ecosystem that allows people to capitalise on knowledge assets in all their forms, whether in creating or consuming knowledge. Knowledge flows across networks, both social and technical, and we conceptualised, created and deployed many socio-technical systems that became this ecosystem. Product and process innovation thereafter flows in a spontaneous manner from this knowledge ecosystem. How long did it take to develop the award winning application? We are now in the fifth year of our Knowledge Management Function as a formal organisation though the seeds were in our minds even as we were dreaming of MindTree. During the last five years, we built five major applications (out of which four are highly collaborative) and several smaller applications that together constituted the award-winning innovation. How difficult was the task? What hurdles did you face? Knowledge management is both a way of life and a change initiative, and the biggest hurdle in its way is in changing people's mindset and consequently, their behaviour, particularly because you are dealing with intangibles like knowledge and relationships. As a new-born entity, we had to bring in a lot of people who had grown up in other organisations and it was not in their DNA. We, therefore, had to and we still are continuously working on it. We wanted to create an enduring organisation that would have a sense of history. We wanted to build it such that it would be high on the value chain from the word "get-go", would build shared wealth and be socially connected. Some people said we are a bunch of well-fed corporate rats and we may not work with sleeves rolled up. Some also said we are "top-heavy" because we were ten co-founders. They did not realise that the bandwidth was planned that way so we could create an organisation-by-design. Then there were the rites of passage like the Internet and telecom bust, 9/11, a global economic slow down and many other others that we tend to exaggerate in hindsight. Tell us about your company's growth over the years? We are India's first venture-funded IT services company to go from an idea to an IPO. We did it in seven years and have gone from 0-5600 people in that time. Last year, we did $130 million and this year, we are guiding to $186 million. In today's world, ideas are not chasing resources. Resources are chasing ideas. An entrepreneur is a catalyst of social change; India needs thousands more who see their life as a blessed act to build large, sustainable, memorable institutions for others, ahead of their personal greed. Success comes from simple things. Our focus on a set of core values (Caring, Learning, Achieving, Sharing and Social Sensitivity, in short - "CLASS") has led us to attract the right kind of people, who in turn have attracted the right kind of customers. Our success in building our knowledge ecosystem can be attributed to taking an organic, holistic approach and going beyond the typical centralised repository and content management solutions that most other companies undertake. We treat knowledge as a living thing. We are in love with the idea of knowledge. Consequently, our focus on building social solutions, collaborative solutions and rolling out programmes to prepare the human mind for infinite possibilities are key differences in our approach to Knowledge Management. We have a significant footprint for a company that is just eight years old. We have a presence in 18 countries and have a wide variety of service offerings in both information technology solutions as well as product realisation services. We have built some of the best intellectual property in the short range wireless space, and have helped chief information officers set their IT strategy. In order to serve both our customers and people better, we have also strengthened our internal processes and systems. The fact that this year, we are India's top Most Admired Knowledge Enterprise (MAKE), and are admired for our people practices, is testimony to the attention we've paid to organisation building. There are never enough good people out there for doing good things in any field. The trick is not to complain about it. Good people do not come in a tetra-pack, we have to nourish, nurture and build goodness in people. We walk in the shadow of giants, we are a work in progress and we will carve out a place in the hearts and minds of our people, our customers and our investors for innovative practices that deliver lasting value. We want to be a company that is a socio-economic role model for developing countries around the world. Entrepreneurship is a responsible act. When you do it, treat it with respect every step of the way. What are your views on innovation in India? How important is innovation for a company? India is just beginning its innovation journey after thousand years of silence. It has huge potential, but we first have to stop patting ourselves on the back and recognise that we have to improve in many ways to truly meet our potential. The most significant change is needed at a mindset level. We need to move away from a mind of coding to specs, and towards leading with ideas. This is a fundamental shift that will be uneasy for many. Businesses that evolve around cutting-edge ideas will be the most exciting to be around. Our ability to transcend cultural boundaries and function in cross-disciplinary areas will determine how innovative we become. After a thousand years of solitude, you begin somewhere. Only then you can go to other places. Product based innovation allows for disproportionate returns, and hence is important to cultivate. It requires us to change our diet and not just the dietary supplement. However, we must continue to innovate in services as well where we have built a name for ourselves. Both types of innovations touch the customer, and the larger Indian ecosystem should encourage their co-existence and interplay. It has to do with the socio-economic and political fabric. Industry is a downstream player. It has proved that ordinary people can do extraordinary things. It has proved that the colour of your skin is not an impediment to global dreams. Having said that, we have not done a good job of communicating three things: Who is the average Indian IT professional? What does she actually do? How has she impacted ordinary lives around herself? Slowdowns are important, even critical requirement for any sector to grow, innovate and remain relevant. People, companies and societies learn only in tough times. Do you think the US slowdown will affect your company? It will impact our company positively. Could you tell us about your interests? How do you spend your spare time? I am interested in everything around me, I am fascinated with life and living and my chance to serve that purpose through organisation building. I have no "spare time."